Pick up from Airport . and transfer to hotel approx. 110 Kms/ 3 Hrs. .Check in at hotel. Over night stay at hotel in Shillong. After early breakfast drive to Mawlynnong – “Asia’s Cleanest Village”. Mawlynnong offers many interesting sights such as the living root bridge and another strange natural phenomenon of a boulder balancing on another small rock. Later proceed to Dawki, a small town near India Bangladesh border. Enjoy breathtaking view of the Umangot River. Evening drive back to Shillong. overnight stay at hotel in Shillong. Morning after breakfast visit Elephant Falls,Ward’s Lake, Shillong View Point,and other sightseeing of Shillong. Afternoon depart for cherrapunji oad surface approx 55Kms/1Hrs 30 Min.On arrival check in at hotel.Visit local sightseeings of cheerapunji like Nohkalikai Falls, Mawkdok Dympep Valley, Seven Sisters Falls, Eco Park.evening return to our hotel.Over night at hotel in Cheerapunji. After breakfast drive on to famous Kaziranga National park (301 kms 7 hrs drive). Check into a Jungle resort on arrival. In the afternoon visit nearby Tea Estate. Afternoon cultural show at Kaziranga. Stay overnight at Kaziranga. Early morning explores any one zone of Kaziranga National Park on back of Elephant. Apart from the Rhino, other species found are Hog Deer, Swamp Deer, Wild Buffalo, Elephants and if you are lucky then tiger also. It is also home to pelicans, storks and darters as there are a number of water bodies inside the Park. Return to the resort for breakfast. In the afternoon enjoy jeep safari through the National Park. Return to the hotel. Overnight stay at Kaziranga. Morning after breakfast depart for Bomdila approx 203 kms / 6 hrs. On arrival check inn at hotel. overnight at hotel. Morning after breakfast drive to Tawang road surface approx 171Kms/7hrs. Check inn hotel. Over night stay at hotel in Tawang. 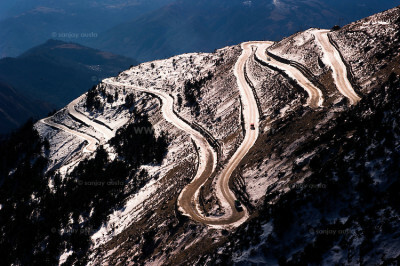 Enjoy the magnificent landscape of the Himalayas drive through the Sela Pass and visit to Jaswantgarh, Nuarang falls, War cemetry- places associated with Indo-China war on 1962. Check inn hotel. Over night stay at hotel in Tawang. Morning after breakfast proceed to Tezpur approx. 324 kms 10.5 Hrs. On arrival Visit to Madan Kamdev, Chitralekha Udyan & Mahabhairav Temple. Check in at hotel and over night stay at hotel in Tejpur. Morning after breakfast proceed to Guwahati road surface approx 184 Kms it would be take 4 hrs. On arrival check in at hotel. Late afternoon Guwahati sightseeing including visit Kamakhya temple, Purva Tirupati Shri Balaji temple, Uma Nanda Temple. Over night stay at hotel in Guwahati. Early morning at 05:00 Am visit Kamakhya temple then Drop at Airport. Note:Please Carry Limited Baggage on Tour.